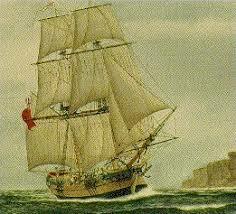 The convict ship Mandarin sailed from Spithead Pourtsmouth on 25th February 1840 bound for Van Diemen’s Land (Tasmania). On board were the Chartist leaders John Frost, Zephaniah Williams and William Jones whose death sentences for High Treason had been commuted to transportation after a public outcry. The Mandarin was a 425 ton S-rigged sailing ship built by Horton in 1834 captained by James Muddle. Altogether there were 212 convicts were on board , being transported for offences ranging from attempted theft of handkerchiefs to manslaughter. According to many sources transportation was considered a very severe punishment for many of the prisoners who by today’s standards had committed relatively minor offences. Thomas Bush, aged 22, convict; scurvey. Put on sick list, 18 April – Discharged 24 April . John Gallop, aged 28, convict; scurvey. Put on sick list, 24 April – Discharged 24 April..
George Coe, aged 33, convict; scurvey. Put on sick list, 7 May 1840. Discharged 4 June . Richard Cass, aged 22, convict; scurvey. Put on sick list, 25 May 1840. Discharged 9 June. Thomas Mole, aged 23, convict; scurvey and catarrh. Put on sick list, 25 May 1840. Discharged 6 July 1840 to the Colonial Hospital. Thomas Evans, aged 19, convict; scurvey. Put on sick list, 27 May 1840. Discharged 2 June. Walter Duke, aged 33, convict; purpura. Put on sick list, 8 June 1840. Died 10 June 1840. William Bolden, aged 52, convict; purpura. Put on sick list, 11 June 1840. Discharged 6 July 1840 to the Colonial Hospital. Charles Baker, aged 30, convict; scurvey. Put on sick list, 12 June 1840. Discharged 23 June. John Morton, aged 24, convict; purpura. Put on sick list, 24 June 1840. Discharged 29 June. Francis Rogers, aged 20, convict; catarrh. Put on sick list, 28 June 1840. Discharged 1 July 1840 to the Colonial Hospital. Jean Jacques Courbean, aged 62, convict; atrophia. Put on sick list, 29 June 1840. Discharged 1 July 1840 to the Colonial Hospital. John Williams, aged 25, convict; hernia. Put on sick list, 2 July 1840. Discharged 2 July 1840 and supplied with a truss. More information can be found about the conversations of Dr. Alex McKechnie on board the Mandarin can be found in Les James’ book, “Render the Chartists Defenceless”. 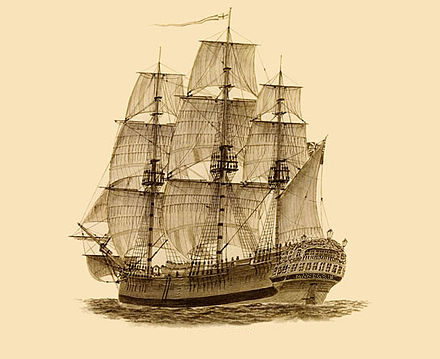 After 126 days at sea on board the Mandarin, the convicts reached their destination of the penal colony at Port Arthur, Tasmania, after a journey of over 12,000 nautical miles, arriving on 30th June 1840. CLICK HERE TO SEE INFORMATION ABOUT THE PENAL COLONY AT PORT ARTHUR – “a machine to grind rogues honest”. Between 1788 and 1852, a total of about 1,800 Welsh convicts were transported to Australia – about 1.2% of the total number of convicts transported there by that time. This is all very interesting- many thanks! Also, Patrick, many thanks for attending our play in June.